Disappointed last week in Daejeon, when experiencing a second round exit at the hands of the host nation’s Jang Woojin; China’s Xu Xin made amends in Geelong at the Seamaster 2018 ITTF World Tour Platinum Australia Open in Geelong on the evening of Sunday 29th July. The no.2 seed, he beat colleague and qualifier, Liu Dingshuo to capture the Men’s Singles title (12-10, 4-11, 12-10, 15-13, 11-6). Aware that he was facing a major opportunity to impress those responsible for national team selection, Liu Dingshuo, a player in the chasing group; in the opening game after trailing 1-4, went ahead 7-5. It was at that stage the lethal Xu Xin forehand took effect, he established a 10-8 lead and was serving; quite incredibly, Liu Dingshuo won both points, returning service with the modern day backhand “banana” wide from the forehand down the parallel, he left Xu Xin flat-footed. However, Xu Xin remained calm, the next two points were secured. Xu Xin one game ahead but in the second, outstanding with short play over the table, Liu Dingshuo responded; he went ahead 8-4, he did not lose another point. Subtle changes of service to prevent the “banana” backhand return from Liu Dingshuo was the order of proceedings from Xu Xin in the third game; for Liu Dingshuo it was a question of creating angles to try to nullify the Xu Xin forehand. Xu Xin went ahead 9-5, Liu Dingshuo responded to level at 9-all but never held a lead, Xu Xin converted his second game point. 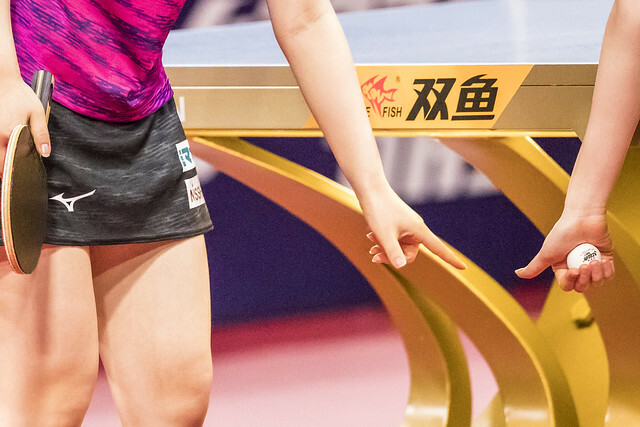 Serving short to the forehand in the fourth game Liu Dingshuo established a 4-0 and 6-1 lead; Xu Xin won the next three points, Liu Dingshuo called “Time Out”. Exhilarating rallies, Xu Xin levelled at 6-all but at 10-8 it was two game points for Liu Dingshuo. Xu Xin saved both; then two more, before on his second attempt securing the game. Winning the close fourth game, turned the momentum of the contest inexorably in favour of Xu Xin; he establish a 5-3 lead in the fifth, he never looked back, at 10-6 he held four match points, he converted at the first attempt. Success for Xu Xin, in a total of what is now 22 ITTF World Tour Men’s Singles finals, he has now won 13 times. Furthermore, it means in each of the past eight years, he has secured at least one ITTF World Tour Men’s Singles title. He won his first such title in 2010 in Kuwait, before in 2011 succeeding in Qatar and Slovenia. The following year he retained the Qatar title, also winning in China and Russia. In 2013 and 2014 he won in consecutive years in the Korea Republic, as well as in the latter year, once again in Qatar. Later in 2015 he prevailed in Japan, before in 2016 regaining his Korean title. Last year in 2017 he left matters rather late to maintain his record; he won in Sweden, the concluding tournament on the calendar. Conversely for Liu Dingshuo, it was only his second such final; in 2014 he had won in Brazil, beating the host nation’s Gustavo Tsuboi in the final. In Geelong, he faced another left hander in the final, arguably the best in the world, it was a different outcome but a most creditable performance. Xu Xin was the champion, Liu Dingshuo departed with great honour.